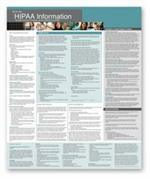 Meets HIPAA notification requirements for all businesses that offer health benefit plans to their employees. Recently Updated to Reflect New 2008 Laws and Enforcement Guidance In addition to critical privacy and discrimination notices, Our 2008-2009 All-On-One HIPAA Poster includes a revised security notice to reflect new 2008 enforcement guidance from the HHS, a new notice regarding genetic information (new law signed 5/08), and a revised wellness / fitness notice to reflect agency recommendations. Failure to comply with HIPAA regulations can result in significant civil and criminal penalties (including fines ranging up to $25,000 in a calendar year). Various federal agencies enforce specific rules under HIPAA, including the Employee Benefits Security Administration (EBSA), the Department of Health and Human Services (HHS), and the Internal Revenue Service (IRS).